This curved boat style glass Hanukkah menorah, or hanukkiyah, from Lily Art is a unique piece of art. 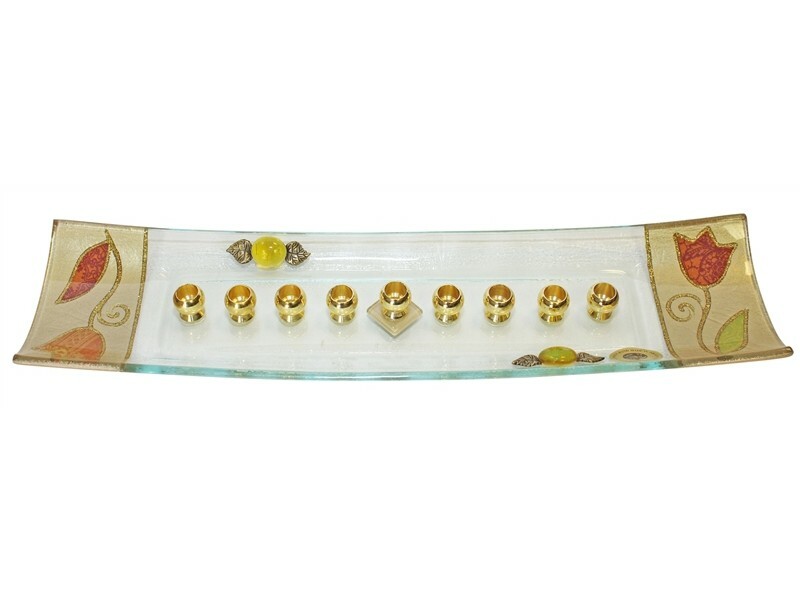 This handmade menorah is set on a curved style glass and decorated with different colored tulips and leaves on a gold background on both ends. The length of the menorah is decorated with two appliqued style decorations of half of a ball and metal leaves. This Hanukkah menorah has a center “shamash”, or helper, candleholder placed on a small gold colored glass plate that lifts it slightly above the other eight candleholders, presenting the eight days of Hanukkah, four on each side.